When it comes to eating out, living in Sunnyside definitely has its benefits. We have downtown Calgary (and Chinatown) just a short walk across the Bow River (through Prince’s Island Park) and Kensington is also just a short walk to the west; both are abundant in restaurants. Last Monday (April 7th, 2008) , we decided to go somewhere new so we tried out Charly Chan’s in Kensington. Our total bill (for three) came out to $55. We started with a "large" order of Wor Won Ton soup (with thin noodles added for $2 extra) and it was, without doubt, the worst Won Ton Soup I’ve ever had. The won tons tasted very floury and the broth, while very dark in color, tasted like plain water. All the vegetables were over-cooked and it’s a good thing that their "large" size wasn’t very big at all. I was very hungry so it wasn’t hard to eat, but it was definitely a major disappointment and a bad way to start a meal. I must say, the chicken in the soup was very good though and extraordinarily tender. Overall, our experience was a pleasant one, (it was a very comfortable atmosphere and the service was attentive), but unfortunately the food at Charly Chan’s really let us down in a big way. I don’t see myself returning there anytime soon – if you’re in Kensington and looking for a great place to eat, this is not one of them. Charly Chan’s is very much below par, not only compared to other Chinese restaurants in Calgary, but especially compared to the other restaurants in the area. 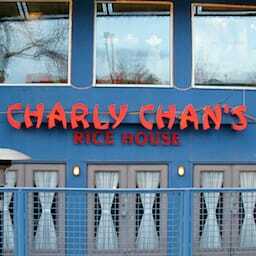 Charly Chan’s was published on Wednesday, April 16, 2008 at 4:13pm MDT by Daniel Menjívar and last updated on April 11, 2018 at 9:30pm UTC .